Flan Recipes That Will Blow Them Away! Flan is a deceptively simple dessert. Made with just a few ingredients that are readily available -sugar, eggs, milk, and cream - it is similar in construction and flavor to other baked custards. This dessert is slightly lighter and a little less sweet than a standard baked custard, but what really makes it stunning is it's heavenly creamy texture. 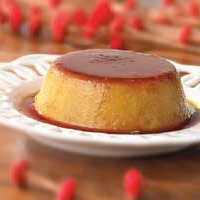 Flan is a stiff egg custard that is baked in a mold, and served upside-down. Before baking the caramel is place at the bottom of the pudding mold. When the flan is served upside-down the caramel forms a lovely syrup that soaks the flan and runs over its sides... ¡Qué rico! Preheat the oven to 325 degrees. Pour the warm Caramel Sauce into the bottoms of six 1-ounce custard cups or ramekins. Using a potholder, immediately tilt the cups to spread the caramel over the bottom and halfway up the sides. In a large bowl whisk until blended eggs and egg yolks, sugar, and salt. In a saucepan combine and heat the milk and half-and-half just until steaming (not boiling), about 6-8 minutes. Then slowly whisk the warmed milk into the egg mixture and stir gently until the sugar is dissolved. Strain the mixture through a fine-mesh sieve into a separate bowl. Add vanilla to the strained flan custard and mix to incorporate. Then pour flan into the caramel lined cups. To bake the flan find a roasting pan large enough to comfortably accommodate the custard cups. Cover the bottom of the roasting pan with a towel to prevent direct contact with the bottom of the roasting pan. Place the cups on top of the towel in the roasting pan. Space them so that they do not touch one another, or come in contact with the sides of the roasting pan. Pour enough scalding-hot water into the roasting pan to come about one-half to two-thirds of the way up the sides of the custard cups. Bake in the water bath until firmly set in the center, 40 to 60 minutes for individual cups. Remove from oven and cool 10 minutes at room temperature. 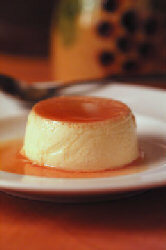 Next, refrigerate flan custards for at least 4 hours up to 2 days. To unmold, dip the cups briefly in hot water and loosen the edges with a knife. Invert flan onto individual plates. Caramel Sauce Recipe: In a small heavy saucepan place 3/4 cup sugar. Drizzle 1/4 cup water evenly over the top of the sugar. Place saucepan over medium heat and gently swirl sugar mixture, without stirring. Gently swirl until a clear syrup forms. It is important that the syrup clarifies before it boils. Next, increase the heat to medium-high and bring the syrup to a rolling boil. Cover the saucepan tightly and boil for 2 minutes. Uncover and cook until the syrup begins to darken. Begin to swirl the syrup again until a deep amber color forms in the syrup. Quickly pour this mixture into the custard cups. Try these other great Pudding Recipes at your next child tea party. 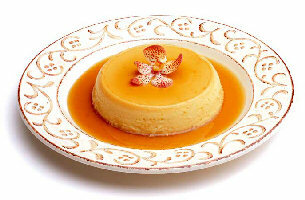 Simply put, flan is a creamy taste of heaven on earth! This popular Latin-American style flan uses condensed milk, to shorten the time it would otherwise take to simmer and reduce the milk and sugar on the stovetop to a thick cream. In a saucepan combine the sweetened condensed milk, whole milk, lime zest, cinnamon stick and salt. Bring ingredients to a boil, then reduce the heat and gently simmer for 5 minutes. Remove from the heat, cover, and let stand until just warm - another 5 minutes. Strain liquid through a sieve into a bowl. In a separate bowl whisk together eggs, egg yolks, sugar, and vanilla. Pouring slowly, gradually stir the milk mixture into the egg mixture. Stir gently until the sugar is dissolved. Next, pour the flan custard into the caramel-lined cups. You will flip for these other great Pudding Recipes! Flan is loved the world over... and understandably so. Espresso beans ground in a coffee grinder would be too fine and impart too strong a coffee flavor to the flan... Instead, crush the beans lightly with the bottom of a heavy saucepan for a very coarsely "ground" bean. In a saucepan combine the milk, cream, and crushed coffee beans, heat just until steaming (not boiling), about 6-8 minutes. Turn off the heat, cover and steep mixture until coffee flavor has infused the milk and cream, about 15 minutes. Next, pour the mixture through a fine-mesh sieve into a bowl. This strains out the coffee beans. In a separate bowl whisk together the eggs, egg yolks, vanilla, sugar, and salt. Pouring slowly, gradually stir the milk mixture into the egg mixture. Stir gently until the sugar is dissolved. Next, pour the flan custard into the caramel-lined cups.